The S12 generation Nissan Silvia was sold in the USA as the Datsun 200SX because the Nissan and Silvia names were not acceptable over here for reasons nobody understands.The 200SX was available with a version of the VG30E V6 from the 300ZX/Maxima, but the coolest version has a the pizza box hood scoop and turbo inline-4. Find this 1984 Datsun 200SX Turbo offered for $5,000 in Mesa, AZ. Tip from FuelTruck. This 200SX looks in great shape compared to most you’ve seen that have either been neglected by their owners or modified by the Fast’n’Furious crowd. This one looks like a creampuff and is only for sale because the current owner (in his own words:) sorta, kinda bought it without my wife’s permission - - I just couldn’t pass it up!!! Needless to say, that back fired on me. lol. LOL, indeed. Under that Texas-sized hood scoop is a 1.8 liter CA18ET inline-4 that is turbocharged and non-intercooled to produce 135 horsepower and 141 ft-lbs of torque. It isn’t particularly powerful, but it makes a good match for the 2500-ish pound S12 rear-drive chassis. On the inside we see a very well preserved dash, funky seat inserts and a very 80s dash board setup with idiot lights aimed at the passenger. The shifter sticks up like something you’d use to stir a witch’s pot and will provide you with hours of entertainment. 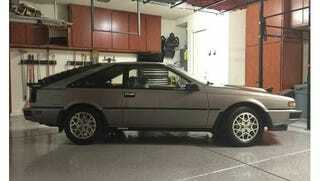 Originally posted as 5k: Always Get Permission: 1984 Datsun 200SX Turbo... on Daily Turismo.